One spring day, Yu Wen and Dz Yuen went to Yang-Ming-Shan National Park to enjoy the beauty of the famous Sakura. Dz Yuen holding Yu Wen’s arm carefully while they were walking slowly along the mountain trails. They talked to each other quietly and sweetly. It was such a beautiful and lovely picture. They did not have a camera to capture the beauty of the scenery for their memories,Yu Wen crocheted the Sakura! Usually when it’s Thanks giving our son’s family would take the long weekend as a chance to go somewhere have a family vacation. They always ask Peter and I to join them. But The weather is very cold out doors. The place they would go is cold and snow. They enjoy ski, What would Peter and I do? We never skied. Our poor bones may scattered all over in the snow. Even to watch them ski, We would become Popsicle. We rather stay home. Warm and cosy! This Thanksgiving is special! Our son’s family decided to have a Thanksgiving Dinner at home and leave home the next morning! In addition to the tradition Thanksgiving food, Peter made some his specialties! Thanksgiving means family reunion! It reminded me the biggest family reunion fgor Chinese, The Chinese New Year Eve dinner. Ever family members scattered far and near all came home. If someone who missed the dinner, a empty seat and a pair of chopsticks would be placed at the table for him or her. But most time every one tried their best to get home on time, by air, by train or bus. So you don’t see empty seat at the table too offten. On Chinese New Year Eve dinner table, food are very different from Thanksgiving Dinner. On the traditional Chinese table: chicken , tangerine , fish and Chinese New Year Cake. They are just as important as turkey, cranberry sauce , corn, pumpkin pie. We always have those foods mainly because of their names pronounced the same as something else. Chicken and tangerine sounds like “auspicious“. Wishing the people at the table a auspicious new year. Fish sounds like “surplus“. Wish people have a surplus coming year. New Year Cake sounds like “taller or higher“. for kits wish them grow taller next year, for adult wish them have promotion in their job or business. You may add as many dishes as you want. They maybe different each year, but chicken, tangerine, fish and New Year Cake should always be seen on the Chinese New Year Eve dinner! No matter how poor the land is for planting, the plum tree always make it. The harder the land is, the deeper the roots will get. The colder the weather gets, the more beautiful the flowers are blossomed. Plum Flowers symbolize China and her prople. As a Plum flower, Yu Wen, she was as honorable as a Princess, even dressing someone would waited on her. As a newly wedded house wife, watching a stranger came into her room. He took off her beautiful window curtain and told her the rant of the curtain was due that day. When she was desperately need food for her loved ones, she rather forgot her princess status to be a laundry lady instead of depression or give up her identity to pick up some easier and lowly work. When Japanese invaded China occupied most part of the land. The life for all Chinese were tough. But Yu Wen lived unrestrictedly. With flowers from the pagoda tree, edible wild herbs for food. Always keeping her upmost spirit, be contend with what she was. People around her affected by her spirit. She loved sharing. Her last wish was to have Everlasting Blossoms blossoming and butterflies flying ever where. Yu Wen was a plum flower! Since the incident of Azalea, Yu Wen began to collect picture photos to crochet new flowers. Neighbors and friends were supporting with all kinds of information. One of her neighbor gave her a magazine “USA Today” Chinese version. 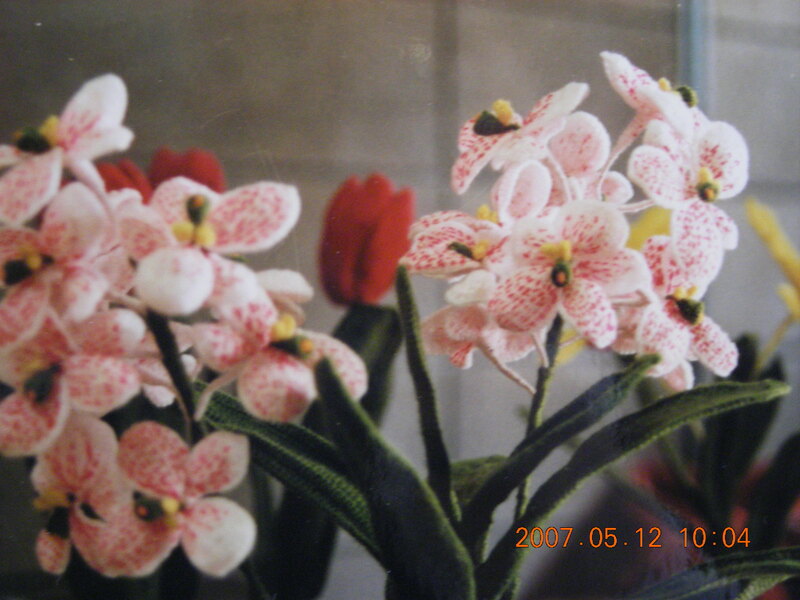 There was an article about Vanda which won the blue Ribbon prize of orchids that year. She had never seen Vanda before. 「 It’s so beautiful! No wonder it won the blue ribbon prize!」 Yu Wen said to herself:「I’m going to capture it with my hook and yarn, I’ll have my own Vanda! 」She was so happy as if she had found some very valuable treasure! After she looked at the picture very carefully, Yu Wen realized that there are some difficulties. She found the petals of Wanda are a little different from the others, they were humped out. And the pistils are very different too. 「 I have to study it carefully.」 Yu Wen said to herself. Yu Wen went through many failures. But when it was unveiled at the exhibitions in Taichung, it won a lot of praises. Yu Wen took the shuttle bus to the market that weekend. She heard a lady was talking with someone at the back seats. The neighbor knew how skillful Yu Wen was but she didn’t know that Yu Wen could crochet three-dimensional flower. She wanted to see them eagerly. Yu Wen invited her and some other ladies to her home to see the flowers. 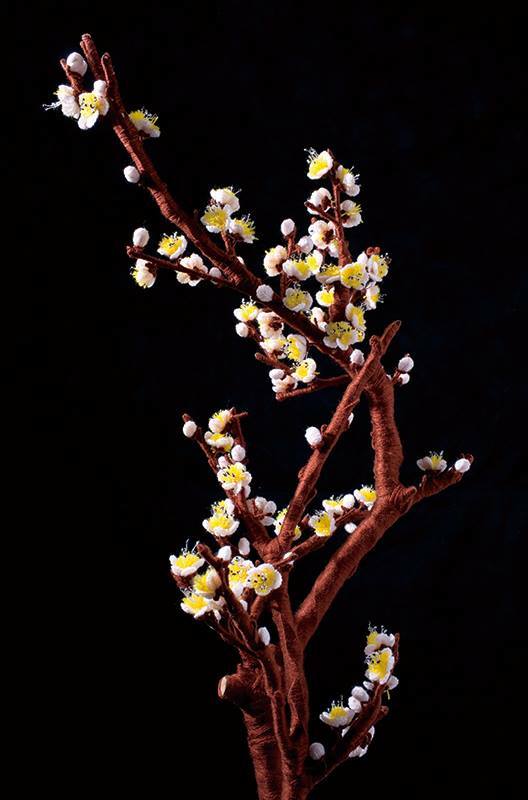 In addition to praise Yu Wen’s work, they suggested if Yu Wen would crochet some leaves along with flower stalk. Place then in a vase. They would look more beautiful. Yu Wen agreed that fantastic idea! 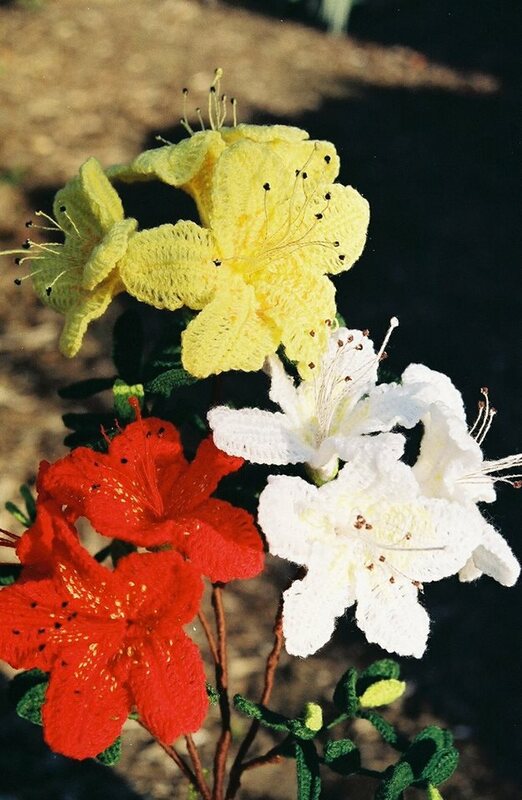 Therefore Yu Wen crocheted some pink and yellow Azaleas. With different sizes of wire she crocheted leaves and put them on the the stalks. There were three bouquets of Azaleas; red, yellow and pink, placed in vase. To show her apology Yu Wen made a rose corsage for the lady who lost her fresh Azaleas. From then Yu Wen crocheted many other different flowers. This noodle soup was the only thing that Dz Yun ever cooked. Nevertheless, it was really very helpful some times. Once the couple got into an argument. After Yu Wen placed the dinner on the table, she went into the bed room without touch any food. Dz Yun felt sorry for what had happened. He tried his very best to apologize to Yu Wen. But Yu Wen was quite and just kept on stared at the book in her hands without turn any page. The dinner got cold! Cold food will upset Yu Wen’s stomach. This should never happen to his honey. Especially today! Dz Yun went into the kitchen. He fond some pork, spinach and dry noodle. He cut the pork into small piece and made some noodle shop for Yu Wen. When Yu Wen looked at the soup in Dz Yun’s hands, her sulkiness cool down and smiled! Her Honey never cooked before! 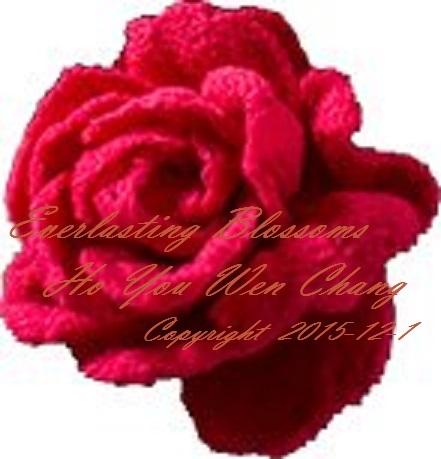 Dz Yun thought all the flowers that Yu Wen crocheted should be named as “Everlasting Blossoms”. Because they always look as beautiful as they were blossoming in spring. Hence “Everlasting Blossom” was named solemnly . HURRART ! I am home again! I lost my home Key and locked myself out of my blog for two days as a homeless blogger! I can only looking in the window listen to my friends talking to me, but no way to let them know that heard them. Say, panic and angry with myself. Stupid me can’t even reset my password! I went to the public library today asked one of one of those lovely volunteer young students. A young lady watched me over step by step to reset my pass word. She said if copy and paste the new pass word you set………. Hurray! voila! I made it! It’s wonderful to be home again! Long live those lovely young volunteers*! * They are a group of young students come to the public library volunteerly on Saturdays from 10 am to 2 pm. to help us seniors with cell phones, ipads, lap-tops . They are Sweet and patiently. Each of us left the library with a big smile! Yu Wen went home with those flowers. With strong spirits of interest, Yu Wen began to crochet while she study the flower. The petals were very different from the roses. They were not as evenly flat as rose. They looked lively! That evening Yu Wen could not think of anything but how those pistils should be made? After the pistils were finished, Yu Wen put them in the middle of the petals, she saw there was something missing. Some small dark dots at the center of the petals were missing. After she embroidered some dark red dots , the flower looked more like what it should be. The time flew faster than usual specially at the last day when Yu Wen put the petals pistil together and embroider the dots. She just couldn’t stop one after another untill she was satisfied with her work. Before she could notice the evening was already there. Yu Wen was totally soaked in the happiness of crochet. One beautiful morning in March, Yu Wen was strolling around the neighborhood. In one of her neighbor’s yard she saw three newly blossomed Azaleas. They looked so beautiful! These flowers enlightened her desire of crotchet some Azaleas. After she got home, right away Yu Wen took out her crochet kits. First she was trying to sketch a Azalea in her mind. She pictured the petals and the pistils. The combination of the petals are very different from roses. But the pistil? She could hardly remember how did they look like. She had to go back to look at it again. Quickly she went back to that garden to study. She stood there looked at the Azalea over for a while, Yu Wen thought it’s better for her to take them home and study it thoroughly. So she can crochet while she was studying. To appreciate this bonsai, it should start with the red rose in the center. In this bonsai, there is no other red rose which tells us the loyalty of love. It dropped a hint that Dz Yuen was Yu Wen’s first love, her only admirer. There are two pink roses, symbolizing the harmonic love of husband and wife. The yellow rose shows the dignity and honor, divine love of marriage, and single-minded of love in marriage. The lilies symbolizing the faithfulness between each other. The gladiolus are for wealth, those little flowers means offspring. Among all the Everlasting Blossoms, Dz Yuen loved this bonsai the most. And he named it “Luxuriant Bonsai”! 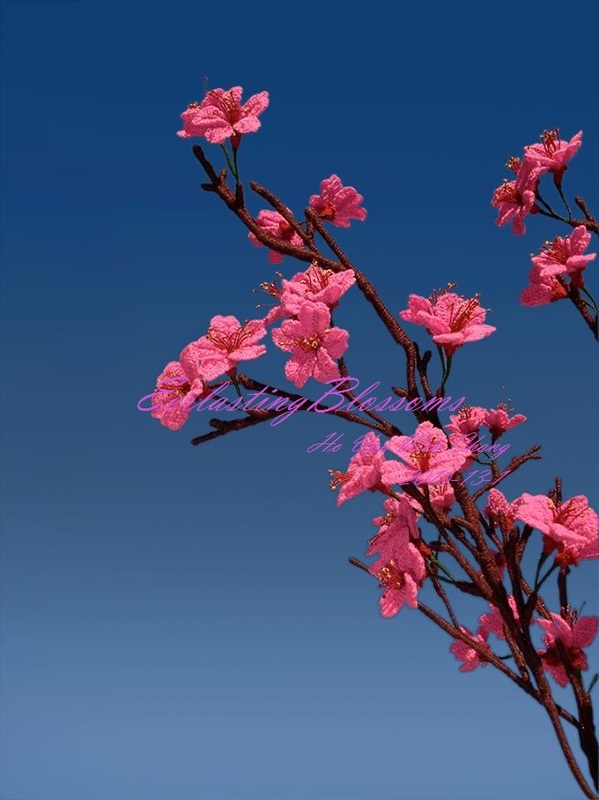 “C14 Everlasting Blossom Blossomed” is on it’s way. Gardening was Dz Yun’s, hobby. After he retired from the Chinese Air Force, he had more time to enjoy gardening. Although Yu Wen never had any serious health problems, she was a kind of fragile. She thought, “What if I have to leave the world before my pal? What will I have to leave for him? What do I have to show him that my love will always be with him? Dz Yun loves flowers, but flowers will wither. What if I can make some kind of flower that will not wither?” She thought of silk ribbon flowers, but the color of the silk ribbon will gradually faded. Embroidery will be too flat. She then found the curtains she crocheted many years ago. Although she had washed them several times, their color remained vibrant and even. She then realized she could use the same kind of yarn to crochet some flowers. There are so many colors to choose from. After she searched many ways to try to create some flower that will remain blossom always, she thought crochet with fine yarn would be the best. First she tried to crochet a rose. When it was done, it looked like a flower alright, but it didn’t looked like a rose! It wasn’t nearly as beautiful as she hoped. She tried again and again and after many failures… the very first rose was born! “What?! My goodness! It’s really good!” Dz Yun was in great delight while he was holding the crocheted rose in his hand and turning it over and over again. The encouragement from Dz Yun was all that Yu Wen needed to carry her to produce the second, the third and more roses. Each looked better than the last. Yu Wen then added the calyx, peduncle and leaves. The rose was alive! The first bouquet of roses was successfully crocheted! Yu Wen had never told Dz Yen her true intention behind crocheting the rose. After they landed at Tainan air port on the southern part of Taiwan, the Ho family were headed to Yu-Gwang Village, a small town at the very southern part of Taiwan. Dz Yun and his family stay there until Dz Yun appointed to his new job. On their way to their destination Yu-Gwang Village, they saw lots of green bushes with beautiful red flowers in them. The long pistils of those flowers hanging down from the center like tassels. All the petals turned upwards and curled like a ball . The whole flower looked like a cute little lantern with a tassel dangling in the air and swinging with the gentle breeze. Syau Wen thought they were lanterns waving by lots of invisible fairs. They were welcoming the new arrivals. The fresh air smelled sweet. The sunlight feels so good. Birds tweeting along with the cheerful sound made by the flowing acequia water. What a beautiful and peaceful scenery. Taiwan was totally an unfamiliar place even the language is so different. It’s like a foreign country to these new comers. The discrepancy caused some humorous happening to Yu Wen. For these new comers’ convenience, there was a convenience store supplied almost all kinds of daily necessaries. The first day when Yu Wen visited the store, she found toothbrush, toothpaste, towels, soap, soya sauce, salt, cooking oil, rice, even rice-cooker, wok and cooking utensils. She was so happy that she can be a real house wife again! One day while Yu Wen was cooking, she found out she needed some green onion, A greengrocer come by. She went out to see if there was any green onion. It happened that Yu Wen didn’t have any small bill that day. She handed him a $10 dollar bill. The onion only worth for 14 cent. She was waiting for her change. Yu Wen was worried about the cooking on the stove. So she said ” Hurry up! Hurry up! I have something cooking on the stove.” The greengrocer said “Thank you very much!” Instead of give Yu Wen the change, he picked up his shoulder pole and ready to leave. “Waite a minute! You’ve not give me the change yet? ” Yu Wen called out loud! Last week with a senior tour group we visited two places; Jelly Belly Factory and Budweiser Factory. Those beautiful, happy and exciting memories will with me for years! As we walked into building I saw…. A little dizzy I felt. I must be dreaming? I’ve never been here before……. But how come this scenery looked so familiar? My goodness! That was more than 20 years ago, while my sister and sister-in -law were visiting me from Taiwan. That was a cursory visit with a tour group! We rushed in and rushed out! It did not leave any thing in my memory box. I guess nothing impressed me but this big fat flying Jelly Belly! But life goes on! Enjoy the present! That’s what my deceased loved ones would asked me to. I believe. We visited the factory. Watching how those jelly beans were made and coated with different colors and flavors. How they were packed in boxes, I was bewildered! At the mid of all those busy machinery and workers, a robot lifted a big sign said “Welcome!”. We weaved back happily! After we come out of the factory, each of us received a small bag of mixed flavored jell belly beans ! When we got to Budweiser Factory, at the big parking lot, we didn’t see any thing related to the product but a big statue of a brilliant horse. I wandered: “how was horse related to beer?” I just couldn’t figure it out “Why” until I asked our tour guide. It was just as simple as 123! In the early days, transportation were no as good as now-a days. Without horses’ hard working, Budweiser wouldn’t be delivered all around the country. And Budweiser would never be as popular as now . From bottling several thousands of beer per minute every day, it’s not hard to figure out it’s Market demand. The best part of this visit was “beer tasting”! The tour-guide took us into the conference room. After we watched a short movie about how Budweiser was named. How the beer was made, etc. Then came the big moment! Beer Tasting”! There werer 4 bottles of different beers. We can choose any one of them. I am not familiar with any one of them. But the one named “Wile Blue” attracted my attention. I had never had any beer in my life! A little Red wine sometimes for special occasions. Almost every one in our group got a glass of those beers. The beautiful burgundy red of Wild Blue! OK! That’s the one for me! I have no idea What did the 8 percent meant. But I still asked only a little bit. That’s how “lit bit” they gave me. The special savoury and mellow smell which I had never had made me floating in the air! I sipped a little. It tasted G-O-O-D! Couldn’t help I sipped a little again! WOW! The middle of my chest was on fire!! Resolutely and determinedly, I put the cup down! The aftertaste is with me right now as I am typing, I am floating in the air again! When the plan was Circling Hai Nan Island in the air, Yu Wen felt very uncomfortable for unknown reason! As the plan got closed to the ground, Yu Wen saw people were playing basketball with shorts and necked upper body! All the families settled in a temporary shelter. Their life become peaceful and romantic! The shelter was just a big house. Big, simple and crude. It separated into several rooms. There were doorways but no doos. Windows without class! Good thing was there was no the winter bitter coldness! Even at night, they have to turn on the fans. Fortunately they found a hut, there was a stove build by clay and rocks. A big rusty wok sat on it They also found some dirty pots, plates, bowls and some other kitchenware. At least they didn’t have to go to San Ya(a small city about 10 miles away)to eat. First of all, Yu Wen asked the ladies of each household to clean-up the kitchen. Meanwhile Dz drove the truck with some men to San Ya to buy rice and other supplies for cooking meals for the whole group. They have three groups people: cooking, cleaning and shopping, Every one working voluntarily in each group. The members of this big family treasured those happy memories so much! At the evenings. Dz Yun and Yu Wen loved to walked on the beach not only because it was cooler on the beach, the beauty of the sunsets were awesome that they had never enjoyed before! The sunset was glamorous. Above the west sea level, while the brilliant colorful sunset was still floating. The Moon was already hanging on the east sky above the coconut trees. Small groups of homebound birds flew over head from time to time. Children were laughing and playing with the sand that they had never did. Dz Yun and Yu Wen hand in hand singing along the beach. To Yu Wen this was a paradise! The days in Hai Nan Island like a vacation to everyone. Vacation never last very long! They had to move on to Taiwan. After the other families were sent to their stops when they arrived to Cheng-Du, it was late afternoon. The truck stopped at the gate of one of Dz Yun’s amateur radio Hams, Mr. Gung’ home. It was located on East Gwie Street. It was a two doors gate. On each side of the gate, there was a stone drum. Dz Yun realized this family is not any Common folk. Someone in this family was a military diplomatic officer. Dz Yun told him his name and whom he was looking for. Not long Mr. Gung came out to welcome them cordially. Usually after the doorman reported to the master or mistress whom the visitor was, he’ll get the permission to show the visitor the way in. But Mr. Gung himself come to the gate to welcome Dz Yun’s family which shows how much they were welcomed. Mr. Gung looked a little younger and taller than Dz Yung. His kind and friendly looking made a very good impression on these tire and wear out travelers. They stepped into the courtyard, it reminded Yu Wen her own motherhouse, she was thinking; “This should be the first courtyard with houses on three sides. These rooms are for the workers and the servants. The houses in the next courtyard are for masters and mistresses.” Yu Wen was right. Between the first and second courtyards there was a two stores building. They were for the guests. The second courtyard was wider. There were corridors instead of houses on each side of the yard. There were some rare flowers planted along the two sides of the paved path which leading to the main room. There were Chinese Cercis and Aglaia odorata in the yard. As they walked closer to the open door of the main living room, Yu Wen saw a elder lady at her sixties holding a long pipe in her hand stood inside the door. Yu Wen thought as if she saw her mother. As if she was at home before she married. Completely forgot she was a visitor. Quickly she walked forward three small steps to the lady, saluted her with Princesses Etiquette spontaneously and gracefully. The elder lady could never imagine that this dusty young lady in front her was an out of luck princesses. Quickly she supported Yu Wen up with both hands and invited her into the main living room and offered her a seat. Yu Wen sat in one of those big arm chairs. Her mother’s teachings all come back to her; only sat on the edge of the chair with her both feet touching the floor.To be ready to stand up when elders asked her a question. All these small motions tells that this person was a descendant of the royal family and well educated with all the elegant courtesy. Old Mrs. Gung had not seen it for years. None of her two daughter-in-laws would know this kind of court courtesy. She felt so sorry for this poor out of luck princess. From that moment on, old Mrs. Gung loved Yu Wen as much as her own daughter. She arranged have the Hos stay on the second floor of the building in between the 1st and 2nd courtyard. She gave one of her a house maid, Peng-Sou to take care of all the house chores, including bathing the children, bring lunch to school for Syau Wen and her younger sisters Syau Yun, younger brother Lung-Lung and Da Chwen. the youngest in the famiy. After school peng-Sou’ll take them home. Under the mandate of old Mrs. Gung, Yu Wen had never been so relaxed! It was a pity that Dz Yun’s family only stay in Cheng Du for about one year. Dz Yun was ordered to take the family to Taiwan via Hainan Island the smallest and southernmost island in China. Located in the South China Sea, separated from Guangdong‘s Leizhou Peninsula to the north by the shallow and narrow Qiongzhou Strait. On their journey, they stopped at Jyan Ge(劍閣). This stop had left a unforgettable memory to the Ho’s. Yu Wen was almost lost her first born son. Jyan Ge was one of the famous scenic spots on Qinling Mountains. They found a very good hotel. The best one on their journey! There was a fountain and some trees in the courtyard and. Clear water flowed out from the fountain for drink, cooking and washing. There were lots of hotel rooms. Enough for each family to have their own room . Hotel rooms were surrounded around the courtyard. Outside of each room there was a washstand with a moveable copper washbowl, A face cloth hang on the frame. They can wash their face with cool, clear fountain water. How luxurious was it for these truck riders. They hardly remember when was the last time they had washed their face! None of them would dumped the water out before they washed their feet. That day was probably the longest day they rested before they get on to the truck. They will continue their journey after lunch! There was enough time for them to walk around the town near their truck. everybody got on to the truck by noon, they discovered one child was missing. That was the youngest one of the Ho’s. The only boy of that family, Lwung-Lwung, who was only three years old. Everyone got off the truck to help to look for him. Yu Wen was so worried and panic. She had heard many terrible stories about what could be happened to those missing children same age as Lung-Lung. Some bad guys would follow a child who walked along on the street. They had some kind of drug in their hand. They would pat on the child’s head to perplex him/her. Then the child would follow no one else but the one who patted on his/her head. Anyone who saw them would think they were family members. The most horrible thing was, they might kill the child and empty the dead child’s internal organs and stuff it with drugs such as heroin or opium to transport to somewhere. The dead child would looked like a very sick child. Yu Wen was crying and calling on Lung-Lung’s name out loud while she was running from door to door on the streets. Finally she found him! Lwung-Lwung was there standing in fount of some strange racks. Watching at the man who was clapping two pieces of wooden bats on each weights hanging down from #1 racks. #2 rack stood separately on the other end. Under the #2 rake there placed a row of baskets with a certain numbers of silkworm cocoons in it. They pulled out a piece of silk from each cocoon. Have each grouped silk went through one of the holes on the #2 rake and hauled each grouped silks through one of the holes on the #1 rack. Have them hang down and tie a weight on them. When bats were padding the weight spun and twirled the group of silks together. Then he coiled the twisted silk on the weight and clasp the bats again. Lung-Lung was drawn to it because of the noise: ” Pa!” “Pa!” “Pa!”s. After Yu Wen found Lwung-Lwung, she was in awe with the procedure of how the silk was made. The situation changes very fast. Not long Dz Yun was ordered to take the group headed to Cheng Du, Sz Chwan. Some of the staff and their families preferred to stay in Han Jung, not going any further. The rest of the team who wanted to go to Cheng Du followed Dz Yu to continue their journey to an unfamiliar place. They traveled with two trucks with no shed. They planned to get into Sz Chwan via Qinling Mountains. Qinling Mountains was amajor east-west mountain range in southern Shanxi Province, China. The mountains provide a natural boundary between the North and South of the country, and support a huge variety of plant and wildlife. Some of which is found nowhere else. But the road from one side to the other was with difficulties and set-backs because of those terrifying precipices. First they put all their lodges in the truck and then have the elders, little children and frail ladies sat in the middle. All the young and strong men and women sat skirt around, to protect the ones sat in the middle from fallout from the truck. Specially for when the truck had to make turns. When it was raining, they would hold the canvas as a canopy. Those circuitous road winding up and down the mountain side which frightened the passengers. It seemed there would a chance for any one of the passengers be flung out of their seat. There were many place of historic interest and scenic beauty on Qinling Mountains. It’s a place that so many people were longing to visit. Never the less those refugees were not in a mood to enjoy. All they longing was to get to a save place and settle down. So they can live in peace. It was cold and windy sitting in a open truck every daytime. They prayed hard for not rain! Because the road could be very slippery and the driver could lost control while he was driving on those slippery winding cliffs. The rain might cause some loosing rockslide rolling down from the mountain sides. Every night they jam-packed in some small inn rooms. It was even hardly for them to turn their body while sleeping. Sometime the driver had to stopped the truck to cool down the engine for a shout break. The passengers would take this opportunity to get out the truck and stretch themselves a bit. They could sat under the pine trees enjoy the nature and the peacefulness. Listen to the soughing of the wind in the pines and the beautiful music offered by many different species of birds. The moments they could put down all their worries and anxieties. With the renewed strength to continue their alarmingly dangerous journey and sustain them to their final destination, Cheng-Du.. The official notice of withdraw to Sz-Chwan finally came to the Air force in Sy-An. Their first stop was Han-Jung. They will take plane to Hanzhong. Yu Wen and the children had never had any chance to ride a plane. They were very excited! But it was an awful experience for them at all. Due to the very early took off before down, they had to go the air port and spend the night there. Was there any hotel close to the air port? No! With all the other families who’ll take the same plane. They all slept on the hard and cold cement floor outside of the plane repair shop against the wall under the dome evaes. It was extremely cold at night. They had to sleep with all their clothing on and covered with heavy blanket. It was warm all right while they were covered with the blanket, but after they got off it, the freezing air made them shivering even their teeth were dancing! “It is a freighter.” Dz Yun told Yu Wen and the kits. In those days, freighter was a three propeller air plane. There were no passenger seats it side. The cabin was much narrower than now a day’s cargo. There were a lot of circular rings and belts on the wall for fastening the goods that piled in the middle. People were standing or sitting on the floor. The engine noise was awfully loud. People had to shout aloud at your ears when they wanted to talk to you. The journey seemed last forever! Finally they landed at Han-Jung. Dz Yun settled the team of families in the hospital rooms. Not too long after the war with the Japanese was over, it began the civil war with the Chinese communist party. The Chinese Air Force in Syi-An decided to withdraw to Sz-Chwan. This news influenced the situation. It went back to the time before the Victory. People started to try to get out of their homes and move to some cities that was not occupied by the Communists. Some people were take advantage of the national crisis to make fortune. Dz Yun’s working unite was a Electronic communication equipments station. As a director of the station, he should keep every single item in stock correctly stored, check every issued item that matched the requisition, make sure the number of incoming items be correctly received. But a few days before they withdrew to Sz-Chwan, Dz Yun found out some un-matched numbers on the records. He checked with his staff but they all declared their hands were clean. He knew those missing items were taken by some of his staff. Some of those communication equipment were rather too big to be transferred to Sz Chwan. Those items will be left behind like presents for the communist. Dz Yun surely would not see anything happen like that. Yet he hated to see those speculators take advantage. One day, Dz Yun told his staff to move all the big items which could not be transported to Sz Chwan out of the warehouse and put them in a big open area. The staff were wondering why did their director told them to do so. Some thought may be their director changed his mind now. May be he gathered all these items together for the buyers easier to choose the ones they like. They were very happy that Mr. Ho straighten out his thinking finally. That evening after everybody went home, Dz Yun dumped some gas on those equipment, lit the match and burned them all. Even Dz Yun had burned those equipments which could not be shipped, but after they settled down in Taiwan, it was rumored that Ho Dz Yun covered his richness with destitute. The actuality was he brought a bucket of gold with him from Syi An. When rumor came to Yu Wen, She just laughed at it. Because she knew it was preposterous. She grew in money but never attached to money. To her, if put money and conscience on the scale, conscience will be far more heavier than gold. Her husband who cherish the same ideals and takes the same course with her. How blessed she is. I was overwhelmed by your support! Thanks to you all! My posts are based your comments and suggestions to help me to improve my writing. Please do help me! Congratulations on getting 200 total likes onmyrahochang. After she recovered her consciousness the very first thing that Yu Wen wanted to do was to try to get hold of her mother, her two sister-in-laws and her nephew. She wanted to ask them to come to Si-An to live with them. Dz Yun agreed with the good idea. Dz Yuen started to contact with the Hams in Pei-Jing. But the only information he can provide was: “An elderly lady with two young ladies and a little boy about 10 years old. They lived somewhere around Tyan-An-Men Square and their names”. There was no address. With great enthusiasm the Hams searched everywhere around Tyan-An-Men Square. With such an incomplete information provided by Dz Yun, it took the Hams almost a whole year to locate Yu Wen’s mother. When they found her they tried their best to convince old Mrs. Lyan to “try” to talk to Yu Wen on a radio station. Finally she agreed. Early that morning, Yu Wen wiped off her tears before Dz Yun saw it. Quietly she walked over to the radio and turned it on, waiting the calling from Pei-Jing. A little before the appointed time, Yu Wen was shaking. The minute when she heard mother’s voice, she was almost collapsed. Dz Yun was shocked and didn’t know what to do. Whether should he stop the conversation with Pei-Jing or kept it going. Finally Yu Wen was calmed down. She told her mother that it was Dz Yun and her aspiration to invited her and her sister-in-laws to come to Syi-An and live with them. The voice of old Mrs. Lyan came from the amplifier was calm and clear. There was no excitement, hard to tell whether the person who was talking was happy or upset! No matter how hard Dz Yun or the hams in Pei-Jing trying to persuaded her, Old Mrs Lyan insisted to turn off the microphone. It left Yu Wen at a complete loss. She sat in front of the radio. Cold and numbness. She burst out in tears. Dz Yun sat beside her speechlessly. He thought it’s better to let Yu Wen cry. Eventually Yu Wen got connected with some of her relatives in Pei-Jing. But the news she received was such a heart broken one: Her father died. Her younger brother was persecuted by the Japanese and died in a tragic death. Her older brother was missing. Now her mother with two daughter-in-laws: one was a widow while the other one didn’t know where her husband is, and one grandson, son of her elder son. The Japanese forced them out of their house. Now they lived at a unknown slum area. While Mr. Lyan was the county magistrate of Tang Shan, all his relatives and friends estranged him. They looked at him as a stranger on the street. No one would visit him but the Japanese. Due to his mentally and physically exhaustion, Mr. Lyan died only stayed on job for one year. One year before the Victory, the night before the secret mission was almost about to be accomplish, the secret tiding divulged. There was no time for Yu Wen’s older brother, Lyan Jen Dung to notify his family not even his only beloved younger brother, Lyan Fu Sing. He was rescued by his friends they took him away secretly before he was arrested. . No one ever knew where he went. Even after the war was over, still no one had ever seen him. Whither he is alive no one knew. Right after the Japanese got the news about the secret mission, they arrested almost all the members of that secret organization and tortured them to death. Lyan Fu Sing’s, the younger brother of Yu Wen, was the most tragic one. The Japanese looked at him with bitterly hate because he was the chief officer of Japanese M.P. in Tang Shan Syan. But no matter how much they tortured him, trying to get some more names of the organization from him, he did not say a word until the Japanese put his thoroughly injured body into a big bucket of string acid. His whole body corroded until the last hair was gone and everything turned into smoke and vanished in the air. The news was provided by someone who was one of the members of the underground mission but trusted by the Japanese. He had seen the whole process. When Yu Wen heard a series of heartbroken happenings, she passed out. In 1940s, The Amateur Radio Stations were very popular everywhere in the world. Anyone can set up a radio station at home. You don’t need to have a license to set up a station. Same as to set up an email, face book or a blog now-a-days. With your station you can talk to people anywhere in the world. After each new station being connected with, they will mail each other a postcard with their name and address. After you have received the postcard from all 7 continents, you can mail them to the Head quarter of the World Amateur Radio Stations Association. They’ll mail back those cards along with a certificate to prove your effort and skill. You are a qualified “Ham”. When next time you get another seven card, you may mail them and get another certificate. The more certificates you receiver the better qualifications for you. The other Amateurs will look-up on you because you are an Old Ham! To set up a Amateur Radio Station, first you should have a name for your station. For the people in China, the name will start with “C” , stands for China. Next to the “C” there is a number. Which telles people which Province you were in. Such as “1” is for the stations located in Shang-Hai. The last two letters usually were the abbreviation of the person’s name who set up the station. The station’s calling sign would be C1XX. Dz Yun lived in Shan-Syi province, it’s number is 6. Dz Yun’s calling sign is C6TW. Yu Wen love to talk with those friends whom she had never met. So her calling sign as “C6OL”(OL stands for Old Lyan). Syau Wen didn’t wanted to be left behind as well. Her father named her “C6YL” – YL was for Lyan junior. Syau Wen miss those good old times so much. When she was sitting with her parents in front of the radio, holding the speaker talking with those uncles and aunts, she was wondering how they looked like: Were they tall or shout? Fatty or skinny? Any time when she heard her father calling: ” CQ,CQ. This C6TW. Please response.” She would ran to her father and stood next to him. Sometimes because of the changing of air current, a new station was just started responding, it faded away. Dz Yun would say” My! Distortion.” Hopelessly. Dz Yun invented an automatic calling card. When he turned it on, it would sent out a telegraphic message into the air. Whoever received the signal can either telegraph back or call back vocally. Dz Yun could keep on talking with someone on the radio while that calling card was working until he saw a green light went on to notify him that someone received his telegraph was trying to response. He made the calling card out from an old phonograph disk. He cut the phonograph small and cut the edge as saw teeth with different sides of teeth and gaps. A needle touched the saw tooth. When The disk turned it came out with different signals. Syau Wen was amazed at what her father had made. She could never figured out how could people understand what her father meant with those strange “Di,Di…….Da…” sounds. When Hams met in the air, they talk to each as if they have been knowing each other for years. In addition to exchange views, they talked about history, culture, tradition. They talked about their families as well. They treated each other sincerely. They were honest and men of honor. If you need some help, they will do their best. After the 2nd World War was over, The news of the surrender of Japan went out through whole China. People were filled with a wild ecstatic happiness. Firecrackers could be heard everywhere for days. Eight long years of tough lives were not in vain. The victory was here finally. Those family members who had been forced to leave their home and wandered away now was the time to come home. People began to contact with their families back home looking forward for family reunion. The Hams of those Amateur Radio Stations played a very important role in helping family reunion.